what tactic should i use for PSG? Yep I think so, although I have noticed ''decisions'' is a big one for this kind of thing. Time To Quit The Game? There's times I feel like never playing the game ever again but I know this is just temporary frustration and realize I'm a die hard fan and the game is not perfect but nothing is perfect or easy. Yep the match engine is weird and in regards to through balls... if your defenders don't have at least 15 POS and 15 ACC then forget it, you will get rekt on the counter. Play a deeper or standard d-line. So using your advice and tweaks I think I have realised that I have lot's of learning to do when it comes to tactics.. Mbappe has just annihilated city. Hi mates. What instruction should I look out for to make my players cross quicker because very often I find my players stop, turn and cross which usually ends up in them losing the ball via a tackle, why can't they already be in a position to cross and not take ages in doing so? I don't think you should drop it... you are correct. I'm also in very advanced stages of the game and can confirm the amount of world-class players are silly.. even the bottom table teams have a few of them. I'm not talking about ''wonderkids'' at poor teams, I mean singings of a 23 year old world class player. It seems like the standard of footballers in terms of attributes are very high vs real players. So I get a blank screen when using the WTS skin, any suggestions? I'll grab you a screenshot of it when I'm home tonight mate. BTW, MM Volante got me 1st place with Newcastle first season... no signings. Good advice. I've given the f9 more creative freedom and changed the AP to support as he was dribbling a bit too much and losing the ball at times, seems to be working well. I gave mbappe an attack duty and he seems to be flying at the moment! Fingers crossed. A little update, I'll go into a bit more detail. Here's the tactic with a little tweak... The style I want to play I would like to play fast tempo attacking football on the break while being solid in defence when we lose the ball.. I' like to be playing the ball through the middle with through balls to our front three as they have good off the ball, acceleration etc. I feel like a lower tempo with a patient approach just makes our front three run into defensive walls and they end up losing the ball or getting tackled. So obviously our strongest players are our front three. I'm aiming for Mbappe to be our main goal threat by using his insane dribbling and technical skills to score goals and play in Lewandowski & Paulinho when given the chance. By doing this I have set up both wingers to cut inside of the open space behind the striker, mbappe to be the attacking IF and Paulinho to sit back a little more as he has good vision and long shots. Our advanced playmaker Gravenberch is designed to sit behind the front three and support them, Kessie is designed to support the front three but also to link play and do a little bit of defending but this is mostly the HB's job, he will sit as a ''5th defender'' so to speak. Lastly our fullbacks will cover the flanks to defend and support the midfield, I find that we get counter way too often if I push them too forward. What I have achieved so far We defend very well, we rarely concede here and regularly have 60-70% of possession against opponents. What I'm lacking Goals! I find our striker isn't scoring enough due to being crowded with defenders causing him to long shot it way too often, same can be said for our wingers. Hiya mates. After days of tinkering I'm happy that I have built a tactic which is solid in defence, keeps the ball much more than the opponent BUT scoring is an issue, I was hoping someone could point me in the right direction as of what could be the issue in terms of penetration leading to a goal? In terms of fullbacks crossing, they stop when up the pitch? I've tried to ask them to byline it and cross more often but they just lose possession as they stop I also tried switching the wingers to IF and the AF to F9 with no difference really. 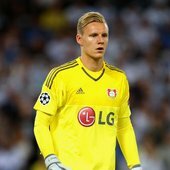 I signed Bernd Leno on FM19 a couple of seasons ago for all of our transfer budget which was 60million (had to sell most of my players to get Leno) and I'm really happy with the club's investment. I thought I would dedicate his regular contributions to the club with a thread regularly posting his world class performances. No wonder my scouts told me to buy him at any price! Take a look... Thanks Bayer 04. You're a star mate. I'll let you know how it goes.